The world of Nuera is a multi-faceted setting that has far more to offer the players of Wraith Recon than just rampaging goblins and shadowy thieves; it has layers upon layers of plots and schemes to uncover. Many of these hidden foes, friends and fates are tucked away in the shadows of Dardarrick. It is up to the stalwart members of the Wraith Recon strike teams to deal with those that rise up against the crown and throne. 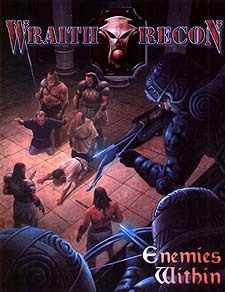 Enemies Within is a sourcebook based around the faith, cults and secret organizations of Nuera. With added rules and information concerning the secret enemies of Dardarrick, this book is exactly what a Wraith Recon Games Master needs to add religious fervour and top secret plots to his campaigns. Not all of Wraith Recon's enemies are as easy to find as hordes of orcs or giants - some of the most dangerous are the Enemies Within.